There are a variety of CPAP sleep apnea machines available for CPAP users, including CPAP , BiPAP/BiLevel CPAP machines and Auto Adjusting CPAP (APAP) . CPAPs (continuous positive airway pressure) blow a single pressure airstream and are the most common types of machines. BiPAPs (BiLevel Positive Airway Pressure) blow two separate pressure streams, one at inhalation and one at exhalation. APAPs (Automatic Positive Airway Pressure) blow a variable pressure stream dependent on the minimal pressure needed to keep user's airways open. You must have a physician's prescription to obtain sleep apnea machines. 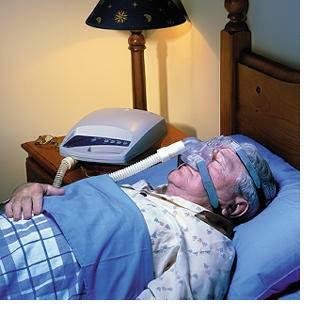 You wll first have to take a sleep apnea test. Your doctor will advise you on which type of machine and mask best meets your needs. All CPAP equipment must be FDA approved. Most sleep apnea machines are available with a heated humidifier. Heated humidification adds warm moisture to machine air, preventing airway passages from drying out and decreasing irritation. To keep CPAP/BIPAP humidifiers clean and sanitary, always use distilled water in your chamber. This helps eliminate the build up of mineral deposits. Empty the humidifier chamber whenever it is not in use. This will not only keep the system clean, but also extend the life of the equipment. It is advised that CPAP humidifier chambers be replaced every six months to ensure clean air inhalation. Using a humidifier is optional, but it make CPAP therapy more comfortable. Most CPAP machines provide advanced data in order to track your therapy progress and performance over time. Your doctor can use this data to make changes in your setup, like changing your mask, or increasing or decreasing your pressure to see if your therapy performance improves and ensure you are getting effective treatment. You can use our CPAP machine compare charts to determine which machines provide advanced data. Nasal Mask Fits over your nose and delivers air through your nasal passages. Oral Mask Fits over your mouth and delivers air through your mouth. This mask is optimal those who are nighttime mouth breathers. Full Face Mask Fits over both your nose and mouth, delivering air to both. If you have claustrophobic tendencies, it may not be your best choice. Nasal Pillows This variation isn't actually a mask as such. Instead, it consists of small, nasal inserts that deliver the air directly into your nasal passages.